As structural engineers move further into the age of digital computation and rely more heavily on computers to solve problems, it remains paramount that they understand the basic mathematics and engineering principles used. Analysis of complex structural systems involves knowledge of math, science, engineering and technology to design and develop environmentally and economically efficient buildings and other structures. The link between the basic concepts and real-world applications is one of the most challenging learning endeavors that structural engineers face. 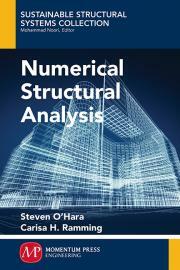 The primary purpose of this book is to develop a structural engineering student's ability to solve complex structural analysis problems that they may or may not have encountered in their studies. Numerical Structural Analysis will cover and review numerical techniques to solve mathematical formulations. These are the theoretical math and science principles crucial to an engineering course of study, emphasized in a numerical formulation. These formulations are necessary in developing the analysis procedures for structure. Once the numerical formulations are understood, engineers can then develop structural analysis methods that use these techniques, primarily with matrix structural stiffness procedures. Both of these procedures will be supplemented with numerical and computer solutions. I n addition, an ability to develop basic programming and use of structural analysis software will be emphasized. The book will be targeted at graduate level civil and architectural engineering students who already have a basic understanding of structural analysis. Steven O'Hara is a professor of architectural engineering and licensed engineer at the Oklahoma State University School of Architecture, since 1988. Professor O’Hara is an affiliate professor of civil engineering and architecture in “Project Lead the Way,” a nationwide program for high-school students. He trains the high school teachers responsible for introducing engineering principles into the secondary curriculum, through project-based learning and coauthored the workbook for the curriculum, Civil Engineering & Architecture Workbook. with a bachelor of architectural engineering degree and dual master’s degree: master of science in civil engineering with an emphasis in construction engineering and master of architectural engineering. Professor Ramming teaches engineering mechanics and has been faculty at OSU since 2009. She recently coauthored Civil Engineering & Architecture Workbook for “Project Lead the Way”, which provides curriculum for science, technology, engineering, and mathematics education used in middle and high schools.